(male narrator) From the Howard Hughes Medical Institute... the 2004 Holiday Lectures on Science. This year's lectures, "The Science of Fat," will be given by Dr. Ronald Evans, Howard Hughes Medical Institute investigator at the Salk Institute for Biological Studies, and Dr. Jeffrey Friedman, Howard Hughes Medical Institute investigator at the Rockefeller University. The third lecture is titled "Balancing the Fat Equation," and now to introduce our program, the president of the Howard Hughes Medical Institute, Dr. Thomas Cech. Good morning, and welcome back to our exploration of the science of fat. Yesterday, we heard from Jeffrey Friedman about events that occur above the neck in the brain, with respect to our appetite and eating behavior. In this next lecture, Ron Evans will take us below the neck to the important physiology that occurs throughout the body so that we can start to understand the complex ways that the body uses fat. Ron has found 2 molecules that control how the body balances the storing and the burning of fat. These are called nuclear receptors. The "nuclear" refers to the fact that they do their job in the cell nucleus. One of these nuclear receptors-- PPAR-gamma-- is important for fat storage, and drugs that activate gamma are currently important in the treatment of diabetes. Now, gamma's cousin, which is another nuclear receptor, called PPAR-delta, revs up the burning of fat, and Ron will tell you about the potential to develop anti-obesity drugs based on activating delta. 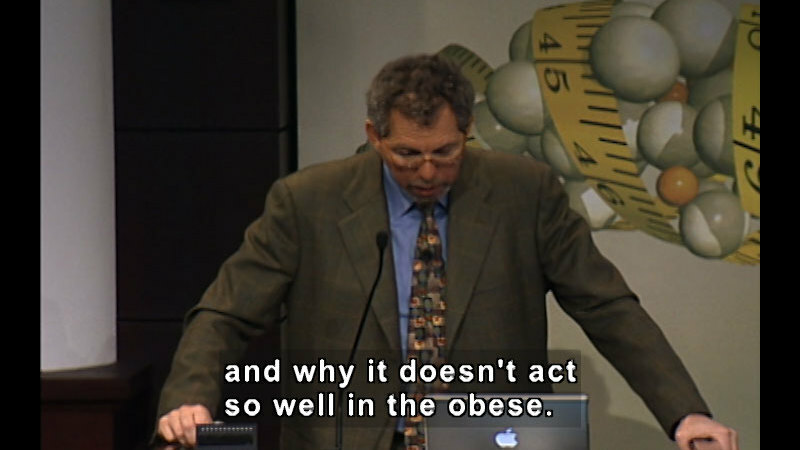 Ron's talk is entitled "Balancing the Fat Equation," and now let's have a brief video to introduce our speaker. and if any of you saw USA Today in the last few days or some of the newspapers, you've seen a lot about how steroids are being abused by athletes. This is in the news all the time. These hormones are the same class of hormones that I'm going to be talking about, and so as you listen to this lecture, you can translate a little bit about what I'm going to say into actual news events that you're seeing in the media today. I thought I'd take a couple minutes briefly just to look at some of the models that are up here, because we didn't mention these yesterday. I did talk about the coronary artery, which is this cutout here, and the heart and the role in fat in metabolic syndrome and in heart disease. This is 5 pounds of muscle right here. 5 pounds of muscle. And this is 5 pounds of fat. So you can see that, relatively speaking, muscle, by weight, is much more compact than adipose tissue. Here's one pound of fat. And these are other models of one pound of adipose tissue back there. When you eat a high-fat diet, the fat goes into your blood, and when you shake this thing, this is sort of the image of what the fat is circulating around before it gets stored in all your adipose tissue. So, if you get a chance, take a look at some of these models, and you can handle them. They're quite interesting. So I told you about how increasing weight tends to...bring us towards a problem called Syndrome X. We're going to talk about that, not just from the weight problem, but actually what's happening at the molecular level today. We did talk about the role of environment, changes in social attitudes that might contribute to some of the weight changes, the increase and exposure to a high-caloric, high-fat diet, such as fast-food diets and fried foods, which are prevalent... PlayStation nation, reduction of exercise, that can actually play into the weight problem, and we even mentioned the role of marketing, and as I said that Marshall McLuhan said that the 20th century, that the art form of the 20th century was really advertising, and we're very susceptible to that. So, moving into the body of the talk, one key feature of trying to understand metabolic syndrome is drilling into the molecular details of what is actually going on. By understanding a disease, we can bring a scientific approach to really addressing to how to treat that disease. So this will inform us about designing drugs, thinking about pharmacology, physiology. Fat itself can be informational. It's not just calories. It can instruct the body as to what to do. It can act like a hormone. And that's what I want to talk about in the first part of the lecture. If we think about how hormones work, and I'm going to tell you the 2 fundamental ways in which hormones work. Hormones can either act at the cell surface, or at the membrane of a cell, or they can act within the cell itself. First, I'm going to talk about how hormones act at the cell surface. This is a schematic of a receptor for the molecule insulin. And this will be our model for that hormone, in this case secreted by the pancreas, acting at the surface of the cell. It binds to its receptor, the insulin receptor, where it triggers an event within the cytoplasm of the cell, which is shown here as these cubes and these spheres and these tubes, as the translation of the activation event from the outside leading to a series of scripted events on the inside. And this is one key pathway, and this can affect other components in the cytoplasm, the membrane, as well as the nucleus. Now, in addition, there is another class of receptors, which are shown here, that reside in the nucleus, and the hormones for these receptors are fats or fat-derived molecules or lipid-like molecules or drugs. And shown in green are the lipid-like hormones that are coming through the bi-layer. They do not need a cell-surface receptor. They can enter into the cytoplasm, where they can diffuse and ultimately enter the nucleus, find their receptor, and as you'll see in this expansion here, the ligand makes contact with the receptor, and that triggers a change in its activity, and I'll show you a diagram of this, where the receptor is able to activate target genes, and we'll describe that in more detail in a moment. But before I do, I simply want to emphasize that there are many different kinds of nuclear hormone receptors, and these control diverse aspects of body physiology. Some of the ones that you might be familiar relate to hormones secreted by the adrenal gland, such as cortisone or cortisol, and that has its own receptor that is in many tissues in the body. It activates sugar metabolism, and it's also a potent anti-inflammatory drug on its own. Hormones from the thyroid gland control your basal metabolic rate. That is, how your metabolism is when you are sleeping, how warm you are. We're all burning energy at all times. And this is sort of our body's thermostat for that. Again, it's controlled by activity in the nucleus. The gonads, the testes and ovaries, produce testosterone and estrogen. Much of these are in the news, either for contraception, hormone replacement, or in the case of androgens, anabolic steroids, athletes tend to abuse these hormones because they're relatively easy to take and get ahold of. We now have ways to trace this, but nonetheless, they are widely used because they give certain advantages to athletic performance. Just as powerful are receptors for dietary fats. Instead of being secreted by an organ, these fats are ingested through the foods that we eat. Some of the fats in these foods are informational, as I've mentioned, and some of these can actually interact with nuclear hormone receptors to stimulate their activity. There may be other types of molecules that can interact with the same receptors, and these molecules produced within the body are also of interest. And so I'm going to drill in a little bit more on the receptors for fatty acids since this links dietary fat to body fat and provides an interesting way to try to understand the nature of fat formation and metabolism. So, there are 3 receptors for fatty acids. They're all very similar to each other. They're called PPAR's. And the 3 related receptors are called alpha, gamma, and delta. And I'll talk a little bit about these receptors. One feature of the receptors is that they are expressed in different levels in different tissues. And so PPAR-gamma is expressed at particularly high levels in adipose tissue and a few other tissues in the body. PPAR-alpha is expressed at high levels in the liver, and PPAR-delta is widely expressed but particularly high in skeletal muscle. Now, if we look more at PPAR-gamma, because that's what I'm going to focus on initially, you're going to see that this receptor plays an unusually important role, and it's a very special receptor relative to many other types of genes in the body as a fat sensor, as I have mentioned, to dietary fats and other types of related molecules. Importantly, this receptor is one of the few master regulators in the body. There are a few genes that have been designated as master determinants of either muscle or fat or certain organs, and PPAR-gamma is a master determinant for the formation of adipose tissue. Without this receptor, you're unable to form fat tissue itself. It's also required for the maintenance and function of adipose tissue, and therefore, by changing its activity, you can change the signals that emanate from fat. And through these changes, I'll describe to you how this can affect the process of insulin resistance. And so we have a fat receptor that ultimately is going to affect sugar metabolism. So let's begin to look at more detail. PPAR-gamma, as shown on this balance, is involved in promoting the storage of fat in adipose tissue. Its other 2 cousins-- PPAR-delta and PPAR-alpha-- are involved in consuming or the burning of energy. So nature has used a family of very related receptors to control 2 opposing processes in the body-- storage and burning of fat. And so, if we want to look at this, I'm going to actually take you through a little journey of what's going on in adipose tissue and take you from the fat tissue itself to the fat cell and to the gene. And so if we can roll the video... what I'm going to show you is the adipose tissue, which was next to some muscle tissue, and we zoom in on it, and we see that the adipose tissue is composed of millions of individual cells. I'm going to focus on one cell as a model, but remember, this event is going on in all cells, and a sample of fat tissue has been included in your packet, which we looked at yesterday. Here is the fat cell, which contains a nucleus. It contains a cytoplasm, and a specialized structure in this fat cell is the lipid droplet, or the fat droplet, that stores triglycerides as the energy source and can release them based on communication with the rest of the body. The fat cell is a hormone-secreting cell. Dr. Friedman spoke about leptin yesterday. It also secretes hormones such as adiponectin in red and resistin in blue. And changes in the size of the fat cell and the amount of lipid that it contains can change the balance of these informational hormones and shift things such as insulin sensitivity and appetite, and so the nature of the fat cell and how large it is is very important to us. Now, in 1995, we discovered that PPAR-gamma can respond to a certain class of drugs, which are shown here in blue, and these drugs, when given to the cell, diffuse across the membrane and cytoplasm and are able to interact with the PPAR-gamma receptor in the nucleus, as is shown here, on genes. Here's the drugs coming in, which, when it binds, will trigger a conformational change in the receptor, shown there, which causes the dissociation of a repressor mechanism for genes, and allows activators to come in. This stimulates the activity of this gene, and because PPAR-gamma is in several locations in the nucleus, a network of genes becomes activated that changes the balance of proteins that are produced by the cell. 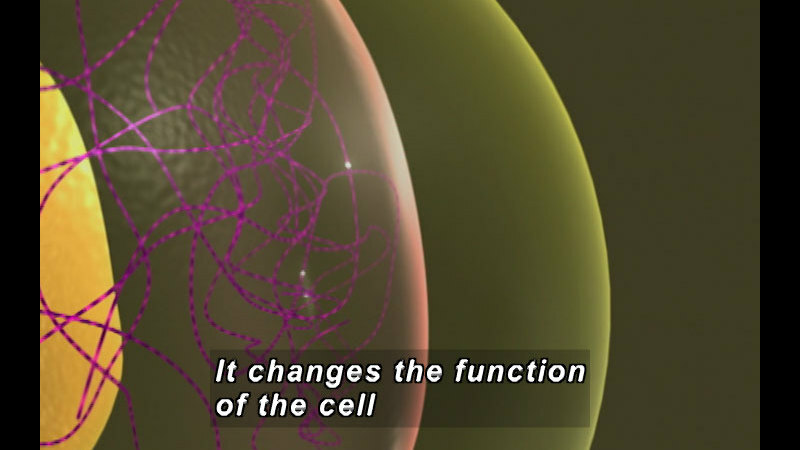 It changes the function of the cell by activating this network. As the fat cell grows, the balance of these hormones can shift, and here it's growing because more lipid is contained. This shifts the balance. However, if we give the drug for PPAR-gamma, you can increase the production of adiponectin. So giving the drug causes this increase, and this promotes insulin sensitivity, which is an important feature because big fat cells often lead to insulin resistance. By doing that, this adipose, or fat pad, can be large, and yet the patient or the individual that has this can be insulin-sensitive. Without the drug, they would be insulin-resistant. And so we can use this genetic manipulation to shift the information that's emanating from the adipose tissue to benefit an individual. But remember, it does not take the fat away. It leaves the adipose tissue there. So you're not getting any thinner, but you're having a healthier fat pad. OK. Now I want to look at the relationship now between this growing fat pad that's proximal to the muscle tissue and how this impinges on glucose. And remember we spoke yesterday about the insulin highway and how elevated levels of glucose from our liver or from our diet stimulate the pancreas to produce insulin, which then allows sugar to be delivered into target tissues, such as muscle. And fat has something to say about this. And the more fat we have, the more communication there's going to be about sugar. And as you see here, increasing fat can cause a glucose gridlock. It can inhibit glucose entering to the muscle because this muscle becomes insulin-resistant. And how does this happen? Well, I mentioned already that fat is a hormonal tissue. It not only stores energy, but it also releases information in the form of secreted hormones, and in the normal individual, you can see the ratio of different types of hormones that are being secreted, and as these fat cells grow and as the adipose tissue grows, the balance of these hormones is shifting, and that balance tends to instruct the body to behave in a different way. Let's look at these instructions. Here, we place the tissue in the body because it is living. And if we look at a normal individual, this just shows secretion of hormones that can instruct the muscle to be insulin-sensitive, that can instruct the brain about appetite, that can act on the liver to also influence liver metabolic function. However, in someone who is obese, there is a different set of instructions that are coming from this adipose tissue. Change in the balance, as you can see here, to each of these tissues, and that starts to reprogram the body. So the amount of fat stored begins to lead to a change in the balance, or a shift. And we want to know how we can use drugs to affect that. I think I already mentioned-- I'll ask anyone. What is the master regulator that we might be able to shift the balance with? Anyone? Someone back there. Is it PPAR-gamma? Excellent job. I have something for you, but I don't know if I can get it way back there. This is a little bit too far, and it could be dangerous. I have such a powerful throw here. But I will leave it up there, and we'll get it to you later. Look what I'm giving you-- a See's lollipop, which is appropriate for a lecture like this. Yes, that's exactly right. PPAR-gamma. So at least you were paying attention there. And by giving PPAR-gamma to someone who is overweight or obese, we can cause instant sensitization of adipose tissue and a reprogramming of the hormones from this larger fat pad to make it seem like it's a thin fat pad, but it's not a cure, obviously, because the individual still has the increased adiposity. And if we look at it in terms of the insulin highway, where we have the glucose gridlock due to the excess adipose tissue, if we give PPAR-gamma, this lets the adipose tissue store the fat in a safer way so it's less toxic in that sense to our body physiology. And in this way, activation of the PPAR-gamma network is going to be highly insulin-sensitizing. And to look through this in a little bit more detail, just as a... really as a summary, what I've done here is sort of taken you through the exercise of understanding the relation between these 3 classes of receptors. I really have not talked very much about PPAR-alpha. Alpha promotes energy burning in the liver. In fact, there are drugs to PPAR-alpha which are commonly prescribed to lower blood lipids, because it promotes fat burning. In the next segment, I'm going to talk about PPAR-delta and some new exciting areas in which PPAR-delta active drugs can also promote new aspects of fat burning to oppose the action of PPAR-gamma. This does not mean PPAR-gamma is not important. We need adipose tissue. It just shows the importance of getting that balance together. And so I'm going to stop at this level, and I'm going to take a few questions before we go on to the next segment. All right, let's start right here. Is there any advantage towards having all the fat in one area in the large pads or just having it evenly distributed through the body? So the question was, Is there any advantage to have the fat stored in one area, such as fat pads? As you can see here in these diagrams and we mentioned a little bit yesterday that fat is widely distributed. So there's always going to be fat embedded in muscle because muscle is one of the primary tissues that demands fat. Then there are many storage sites that we need and nature has programmed, so that if we hit times of famine, oftentimes in the winter, when food is less available, where stored peripheral fat is a very valuable source to stay alive, and it's very characteristic of individual species, where their long-term storage fat pads are. It's different in rodents and squirrels, and mice, for example, have a special fat pad on their back that they use to generate heat called brown adipose tissue, and when it gets cold, this tissue just burns fat and generates heat. It's not used so much for muscle energy, but to produce heat. We only have a little bit of brown adipose tissue for heat generation. And so each of the fat pads either provide immediate energy to muscle or longer-term storage when you starve. I should say that people are very good at starvation. It's something that is part of our genetic makeup. So we're very good at feasting, and we're very good at fasting. And during the feast, we will store all the energy that we can, and during the fast, we will slowly burn these energy stores down from the fat pads. So that's a good question. Give you a shirt for that. This one I can get. Right here. You said that the gamma... regulates insulin resistance. Is there any way to, like, change that so that you can help people with diabetes? Yes. Well, so there are drugs now to PPAR-gamma-- I should be pretty specific about that, and thank you for the question. There are 2 prescription drugs. They're about a $5 billion a year set of drugs now that function to activate PPAR-gamma. These are widely used in Type-2 diabetics. They act to promote insulin sensitivity. So as we gain weight, the ability of PPAR-gamma to promote insulin sensitivity goes down, and the drugs seem to ramp up the system. And so these drugs are very popular. The problem is that when you give the drug over a long period of time, people tend to gain weight because it stimulates the adipose tissue to hold on to more fat. And so it does that in a safe way, but on the other hand, the one thing that patients don't like is that they're putting on a bit more weight. And so there's always a yin-yang for these types of drugs in activating their genetic programs. You kind of get what you asked for. So the patient's healthier, but they're certainly not any thinner. Good question. OK. Right here in yellow. The drug that you give with the PPAR-gamma in it, can you develop a tolerance towards it, or do you just need the same dosage the whole time? For PPAR-gamma? Actually, there's been very little evidence for development of resistance to the drug itself. It's fairly well tolerated. There are a few side effects, which I mentioned. One is weight gain. The other is water retention, which is not also a welcome side effect for people. And that causes some compliance problems. But mostly the drug is well tolerated, and so, you know, there are... some advantages and disadvantages to these types of drugs, and new ones are coming along the pipeline. But no resistance has been seen so far. And I should say that the receptor which I showed you that we characterized back in 1995 as the actual target for the drug is now under study in probably a dozen different pharmaceutical companies across the world, using that receptor now as the molecular target for drug discovery and using assays that we developed in our lab to refine these drugs to a new level. And it really shows how basic research can impact on that drug discovery process. Here you go. Somebody will help. Somebody from the back. Let's go way to the back. Yo. In red. Yeah. Yesterday you mentioned that unsaturated fats can communicate with other tissues, and saturated fats cannot communicate. And I was wondering if that meant that the saturated fats don't contain the PPAR trio of hormones. Yes. And so she's asking-- I said some fat's informational. All fat is caloric. And the saturated fats have the least amount of information. And that is true. The saturated fats are the fats that are least able to bind to PPAR gamma, alpha, or delta, and because of that, they kind of go by those receptors. They don't have the information. They don't activate as much of the fat-burning pathways, and they're simply stored as part of the "let's grab all the energy" mechanism in the body, and so they're easier to store, and they don't trigger as much fat burning. So that's a very good question. So there are some fats which are informational, and the saturated fats have the least amount of information but all the calories. I think that we're going to have to move on. I'll take some more questions in the next segment. OK. Here I'm going back to our surfer and then our channel surfer. This is how we started, and this is where we ended up in Lecture 2... with the pattern shifting from the trunks to the chair. We saw the progress, sort of the complex journey, that we went under to go from young and in fit shape to out of shape. But now if we're in this condition, and there's a growing number of people in the Western world, in the United States, that are in this condition. As Jeff mentioned yesterday and I've been trying to emphasize, metabolic syndrome, or Syndrome X, is the most rapidly growing medical problem in the country. And so, now how can we deal with the problem? How can we use science to really understand what this problem is? And what is actually the magnitude of the problem? How big is the weight problem literally? And so I've done a calculation-- and this is a very conservative calculation in the United States-- at how big the problem is. The problem is 3 billion, 5 million pounds, which is shown here. That is, this is how much the United States as a society, as a collective group, is overweight. We are billions and billions of pounds overweight, and if you look... this is not actually changing. It's going up as we speak. And, in fact, this is a very conservative estimate. And I could be clicking the clicker for the whole lecture as we watch the weight of the United States go up. We are expanding at a relatively rapid rate, at an alarming rate, and this is causing the major medical problems that are driving the health-care budget to such high levels. It's hard to tell a country that the best way to lose this weight-- and we need to lose 3 billion pounds as a society-- is to exercise and to diet. We know that is not effective, because we've been telling people that, and the weight problem really has not changed. The trend is still continuing to increasing weight. And so we need to think about how we can use science to address this problem. If we look at the balance, the energy balance here, there are various ways to think about how this can happen. One is, as Tom mentioned, above the neck, where we can look at appetite control and see...we know it's hard to tell people to change your appetite, but as Dr. Friedman is doing and others in pharmaceutical companies, maybe we can use our understanding of the appetite pathways to address how we can develop drugs or pharmaceuticals to control appetite. The other is the below-the-neck approach, which is to expend more energy. Now, again, we can tell people to exercise, but exercise is not something that people do at their maximal level of efficiency to burn off enough calories to change this trend. And so, again, is there a way for pharmaceutical intervention that can cause us to expend more calories? And in fact, there have been a number of drugs over the years that increase metabolism and will cause increased expenditure of calories in the form of heat, but some of the side effects of these drugs have not been very safe, and so they've had very limited use because of safety issues. How can we use the receptors that we've been talking about to address this issue? Let's look back at PPAR-- the PPARs. In particular, I want to focus on one of these receptors now-- PPAR-delta. The PPAR-delta receptor, which I'm showing here associated with muscle, is particularly interesting because this is associated with oxidative metabolism. That is, this receptor, instead of promoting fat storage, promotes fat burning by increasing the ability of muscle cells and other cells to take in long-chain fatty acids and break them down and convert them into ATP for energy. Now, can we use this receptor as a genetic regulator to help manipulate this pathway? And so, one of the questions is, Can we, with Delta Man, sort of like Superman here, can we use the PPAR-delta receptor and a drug or its ligand to rev up metabolism? And in addressing this question, in fact, I'm going to show you some animals that we have generated to... that address this question. It's relevant to know what the substrate is that we're working on, and the substrate of muscle is actually quite interesting. It's both complex and simple at the same time. We all have an image of muscle. There is a diagram of it up here. Muscle is composed of 2 key fiber types that are in bundles. One fiber type is called fast-twitch, which is shown here, and the other is a slow-twitch muscle, which is shown here. Fast-twitch is often called glycolytic fiber. It burns sugar for energy. It's fast-twitch because it's involved in speed. Mo Greene, for example, the sprinter, is the only human who can do the hundred-meter dash in 9.79 seconds without steroids. We know others can do it with steroids. Certainly, it tells you what the body can do. This is fast-twitch. It expends a lot of energy. In those 10 seconds, basically, that individual is exhausted. The other is nonfatiguing muscle that is typical of long-distance sports-- marathon runners, cyclists such as Lance Armstrong, for example, and this muscle goes on and on and on. But it's in the more repetitive slower motion. These muscle fibers are innervated by different motor neurons from our spinal cord, and these motor neurons direct the fiber type-- fast or slow twitch. You've seen muscle fiber in various types of guises. Of course, we all just got through Thanksgiving, and you're often asked, "Do you want white meat or dark meat?" White meat is the fast-twitch muscle, and the dark meat, which is the richer meat, it's more textured, has increased myoglobin content. It's able to capture more oxygen, increased fat, so it's a richer meat than the white meat. And so that... the genetic programs that make it light or dark relate to its energy utilization. So here's the... the Arnold is more fast-twitch, and Lance is going to be more slow-twitch, using the turkey analogy. In certain types of animals-- and you've seen this in migratory birds, for example, that fly long distances, will have much more dark meat, like duck, for example, or geese. And they'll also be a much richer type of food to eat. So, what are the differences between these muscle fiber types? These muscle fiber types are...contain... structures called mitochondria. I'm sure that all of you have studied this. There. And the fast-twitch, this is a histologic section of fast- and slow-twitch, and you can see differences just by histologic stains. This is a stain for ATPase and shows that the nonfatiguing muscle has much more ATPase in it because it's going to be burning ATP at much higher levels for a much longer time. And this is an example of the increased mitochondria that are present in these muscle fibers relative to the white meat, or the fast-twitch fiber. And so I'm just going to... take you now on a little journey. I took you on a journey through an adipose cell. Let's take ourselves on a brief journey through a muscle cell, and if we can roll the video, I'm showing you here a muscle cell containing these long myofibril stripes that you can see going vertical, which are involved in contraction, a nucleus that is close to the cell surface, and what are called myocellular fat depots that are typically present in people who are overweight and insulin resistant. But they can be drawn down with exercise to provide some energy to the fat pad. Now, fat from the diet or from adipose tissue is going to be taken up from these fat pads or from other sources during exercise. And as you're going to see here, a drug that was developed to PPAR-delta can diffuse through the membrane of the fat cell and bind to the PPAR-delta receptor-- very similar to what we saw with PPAR-gamma. Now we're looking at PPAR-delta networks in muscle. It triggers the same type of effect. Very similar receptor. The conformational change. The repressor is released. The genetic activation system comes in. And now the muscle energy-burning genes are stimulated, and the muscle delta network is stimulated to activate oxidative metabolism in this tissue. It leads to a change in balance of its energy composition as this network flickers on and off and as these genes are going. And thus tinkering with the molecular machinery can cause an increased burning of fat and adipose tissue and convert that stored energy into burned energy. And therefore, by revving up the PPAR-delta network, we might be able to increase energy burning. Now, that led to a potential experiment-- is what would happen if we do genetically rev up PPAR-delta in muscle and we increase this burning? And I'm going to show you, in fact, that we're able to do that, can genetically engineer fibers, as I'm going to show you. And if we actually show you from the animals themselves, these are cells from a PPAR-delta mouse that's been revved up, and these are the cells from a wild type or a normal mouse. And so you can see there's more of these ATPase-burning non-fatiguing fibers. But normally, muscle fiber is generated by exercise. If you want to get slow-twitch muscle, you've got to go jogging or you have to go riding or swimming or something like that. If you want to increase your fast-twitch muscle, you've got to sprint or do weightlifting or various other exercises, or a combination of these 2 will change the balance. We each are born with a ratio of these 2 fibers. You can shift that with exercise. If you do not exercise, you'll be weaker. You'll have smaller muscle mass relative to if you do exercise, and that's both true for males and females. But all muscle generation is linked to motor neurons, and as you exercise more, and if you're a runner, you know this-- that not only do your muscle fibers change, but also the circulation to the muscle fiber changes, because as you get more fiber, you need more circulation. Also, you simply can't just get out and run. Your heart has to change along with your muscle, and so a long-distance runner is going to have a much more powerful heart, which means a slower heartbeat at rest. And so all these changes which are complex changes in body physiology, are part of training. 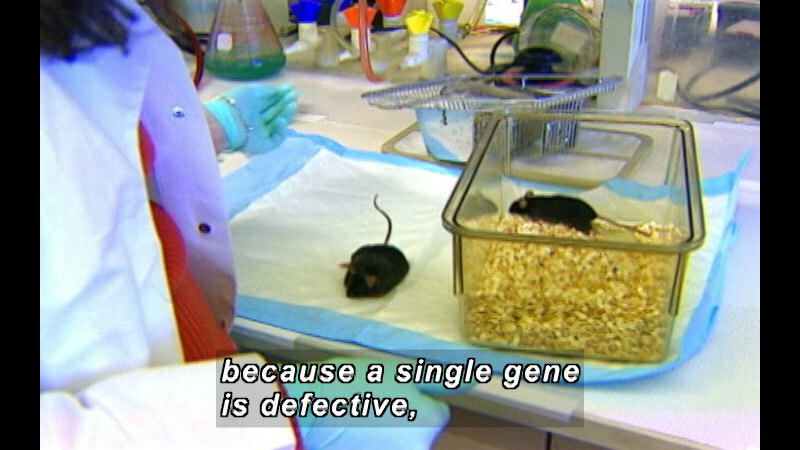 And so now we've genetically created a mouse that has never run and has artificial fibers, in a sense. They're real fibers, they're in the muscle, but they've never been trained. And so, will this mouse be able to run better or worse than the wild-- will the PPAR-delta mouse be able to run better or worse? And if we can run this treadmill video... the way we analyze this is we actually took mice, and we put them on a mouse treadmill, just like we put on a human treadmill, and the only difference with the mouse treadmill is that they can't get out. And I'll show you the mouse treadmill in a moment. And they were asking, with the PPAR-delta mouse, is it can talk the talk, but can it walk the walk? And so I'm going to ask you to take your little voting machines and tell me whether you think that the genetically engineered muscle is going to allow the delta mouse to be a better runner, a worse runner, or the same runner. And this is a long-distance run. And it will be the very first run that the mouse has ever done--untrained. OK, we're going to see what you guys say. About half of you said that it's better, and the other half said that it's going to be the same or worse. And again, it's a little bit different than the other surveys that we've taken on this. But before we go into actually showing you the actual experiment, I'm going to ask you-- you saw the mice that were up here yesterday, scampering around, and so since we're going to put these mice on a treadmill, I'm going to ask you, "How long do you think a normal mouse can run on a treadmill in its first run?" 15 minutes... 45 minutes... or 90 minutes? So let's see if you can... guess at this, and this will be-- we'll look and see what the tabulated results are. And so 32%-- this really scatters the group here a little bit. So 32% say 15 minutes. 46% say 45 minutes. And a smaller number of you say 21-- I mean, 21% say 90 minutes-- an hour and a half in its very first run. And so now we're going to look and see-- and I'll tell you the answer to this as we look at the run. If we can roll this video, here is the mouse on the treadmill, and mice are very happy. They keep running along. Here they are in the treadmill, just like a human treadmill-- keep going. They keep running. This is the Smarty Jones experiment-- who's going to win? It's like you've been at the carnival almost. OK, let's get the bang. This is the delta mouse over here. This is the wild type mouse over here. And you can see basically they're both pretty good runners. Now let's move into the experiment a little bit deeper from a different angle. They will not run off the edge either. It's very interesting. If we go a little bit later into the experiment, here we're now at an hour and a half-- 90 minutes into the experiment. This is the wild-type mouse. This is the PPAR-delta revved-up mouse. Aw. That's... but he did a good job. Ninety minutes. He outperformed what most of you thought he would do. Eighty percent of you did not have faith in him. And so, um... the revved-up PPAR-delta mouse did something rather remarkable. He kept running on that treadmill for another hour-- vastly more than we had ever expected in his very first run. So this basically was a genetically engineered long-distance runner. It was an awesome change. Usually in science, we expect changes of 5% or 10% if we're lucky. I love it when you get a surprise on the very first time that's much more than you expect, and then you kind of realize that you're onto something. And that's what happened. This experiment was recently published only a few months ago. And as a result, I find myself now suddenly working on exercise physiology-- again, one of the last things I ever thought I would be working on, but one of the interesting things, as it relates to the debate in society about the role of exercise, energy metabolism, and health. And so I've become much more interested in oxidative metabolism as a key feature in the energy equation. Now, Dr. Friedman showed you some of these animals yesterday. These are obese mice. And I know they're very cute, and they are very, very nice mice. Exceptionally friendly. These are the cuddlers, I have to tell you. And this is also an obese mouse. Eats the same amount of food, basically gets the same amount of exercise as his littermate here, but this one has its PPAR-delta metabolism revved up. Now, it's not normal weight, but it does show you that revving up metabolism in the muscle can cause increased burning of the adipose-- the energy stored in the adipose tissue and lower the weight of this animal about 30%-- a very substantial weight. And so this is a genetically thin mouse. Even without getting exercise, it's getting a benefit from the training. And so, on the last slide here, I simply want to emphasize, kind of in summary, whether or not...what the potential future might be for this type of metabolic pathway. And if there was a pill that we could generate-- and this is an example of that-- what might be possible to pharmacologically... perform using the PPAR-delta pathway? And in fact, there is a pill that has been developed. I'm not going to make it available to all of you. It's still experimental at this stage right now, but I will be... happy to talk about it in more detail. And these pills actually have been developed for people. They've been given to monkeys. They've been given to animals, and they've been through phase-one clinical trials in people. The goal is to try to lower lipids and improve lipid quality of individuals who have hyperlipidemia. But we believe that this pill may also have some potential benefits on protecting individuals from weight gain, and we've been studying that process in these animals, and in fact, we can prevent weight gain in animals that are placed on a high-fat diet. So I have one more question for you. If you could create this type of magic pill-- and we'll go to the last question-- a PPAR-delta pill that would rev up metabolism and promote weight loss, would you take the pill? And so, let's just take... let's just see where you are in that. All anonymous. Well, there you go. Sixty percent of you said, "Yea, I'm ready. OK." I'll talk to you guys afterwards. The other 40%-- thank you for coming. No, so this is very interesting, and I think it just gives us something to think about-- the potential of how science can impact on physiology and direct us into new areas of medicine and actually drug discovery, which, obviously, was not my initial goal in this work, but may be one of the important consequences that come out of it. And on that level, I'm going to stop and take questions. OK, one right here. I have read some articles that say that after exercise, people are more receptive to insulin, and I don't know if you found... if you found the same, if that research is still being held as correct as it relates to your PPAR. Yes. So the question is, After exercise, are people more sensitive to insulin? That's a very good question, and the basic answer to that is yes. In fact, most physicians will tell anyone who is insulin resistant or diabetic that getting some exercise is very good, in part because the exercise will burn down your blood glucose levels. Even a little bit of exercise will be very helpful there and allow you to become more insulin sensitive. And some steady exercise, even walking, is exceptionally beneficial to people who are insulin resistant or diabetic. As you become obese or very obese, it is harder to exercise, and therefore, it is harder to get the benefit from exercise because you tend to tire out more quickly. But simply said, any exercise that will burn down energy in the body is a very insulin-sensitizing process. So exercise is good of any type. Do they know how that works in terms of hormones and such? Well, it has 2 critical benefits. It reduces the store of energy that the body is containing. Remember, insulin resistance is in part a measure of the total amount of energy that's being stored, particularly of fat. But sugar levels will burn down relatively quickly in your blood, and within about 30 minutes or so even of walking at a moderate pace, you'll start burning down fat. And so you'll get the twin benefit-- building up some muscle, burning down sugar, as well as burning up some fat. And so there's actually a triple benefit for exercise. And you get a shirt for that. All right. One back there. Are there side effects that have been seen in this phase one of testing the PPAR-delta and, like, giving more than is naturally made? So the question was, are there side effects in giving the PPAR-delta drug that's under development? And so far, there really aren't any clear side effects that we know of from that particular drug. I should say that phase-one trials are mostly safety trials, and they're designed to see if the drug is safe in a population of relatively healthy people. They look to be fairly safe. They've been given to primates, where they've performed fairly well. But that's much different than putting a lot of people on a long-term trial, especially people who are ill or have medical problems such as Syndrome X. So whether people who really need the drug will have problems, we don't know yet. But people who are reasonably in good shape-- and primates, actually, who are obese and insulin resistant, seem to tolerate the drug fairly well. Now, that doesn't mean that there's not going to be stumbling blocks. For most drugs, they do hit stumbling blocks. And anticipating that, already 4 or so more drug companies are in the process of developing the next generation of PPAR-delta drugs, again using this exact molecular receptor which I showed you during the talk. And so, so far it's looking promising. I can make mice lose weight with this drug, but we really don't know what's going to happen yet to people. Well, close. Let's go to the very back row. I was wondering how long it takes for these injections to take effect on the muscle, for example, with the PPAR-delta? So the question was, How long does it take for a PPAR-delta drug to take effect? Actually, it begins to take an effect very quickly, within a few hours. But remember, we're looking at a transcriptional pattern here. And so to manifest the complete effect, we keep our animals on the drug for several days or a week. And we monitor changes in patterns of gene expression during that time, and one of the effects we see is the increase in mitochondria, mitochondrial enzymes, and oxidative enzymes involved in fat metabolism. But that actually begins relatively soon and keeps going for several weeks. And it can also be affected by whether you are exercising these animals or not. That's a good question. It's a progressive process. And I don't know if I can get this back there, but I'll try. Oh, she caught it, too. Time for one more question. We'll do it here. I assume since there are these drugs you're giving in pill form, they eventually wear off, and I was wondering if there's any way to genetically affect these repressor proteins and allow the translation of the DNA by way of using a virus as a vector perhaps to achieve some sort of lasting genetic change? That is a way too sophisticated question for a high-school student, so I'm not going to give you that shirt at all. No, that's a very good question, and the answer is that already there are drugs that are being developed to act on the repressor proteins. Those repressor proteins happen to be enzymes. And so we can develop inhibitors to those enzymes that are called histone-deacetylase inhibitors. A half a dozen of these are under development right now. If you inhibit that enzyme, it effectively acts like an activator of the whole pathway, because you're inhibiting the repressor. 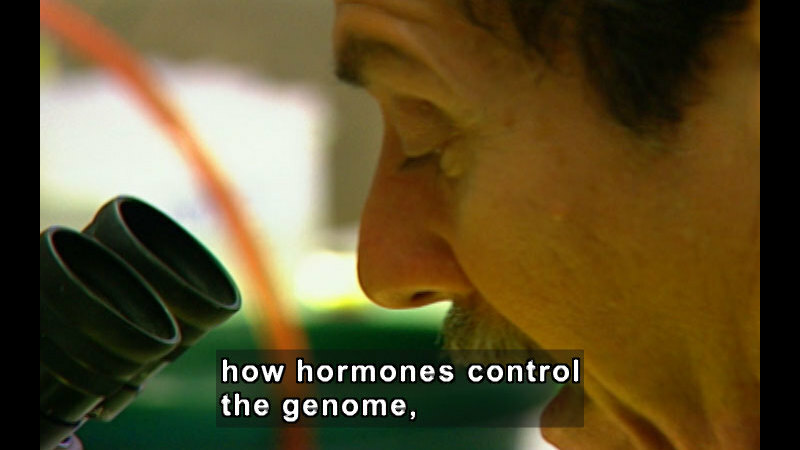 And that's a very interesting new area of pharmacology and gene control that's currently under investigation. It's a very exciting area, and it's one that we actively study in our own lab. And it's going to be probably a source of a series of important new drugs. And so that is a question, and I'm just kidding. I will give you a T-shirt for that. There you go. OK. So with that, I'm going to conclude. It's been a great pleasure to talk to you. I have to say that I wish I could answer all the questions. Every time there's time for one more question, I see about 80 hands go up, and you guys have been real terrific about this. And so it's been a pleasure to get a chance to tell you this story. And thank you all. Thank you, Ron, for that outstanding talk. We're going to take a break now for 30 minutes. When we come back, we'll have the final lecture of this series, when Jeff Friedman will tell us about some evolutionary consequences or implications. Dr. Ronald Evans reviews how cell receptors called PPARs regulate body weight by controlling fat burning or storage. Part of the 2004 Howard Hughes Holiday Lecture Series.